Interested in living in a modern timber home? Or maybe you like the idea of living (really) small. 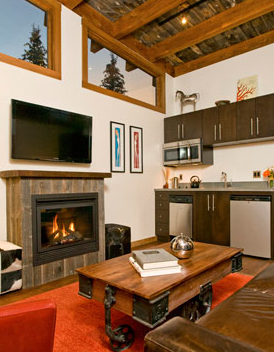 Why not test drive both at Fireside Resort in Jackson Hole, Wyoming? It's here amongst the mountains and wildlife that you can vacation in a 400-square-foot timber-accent getaway, built by prefab builder and mini-home provider, Wheelhaus. 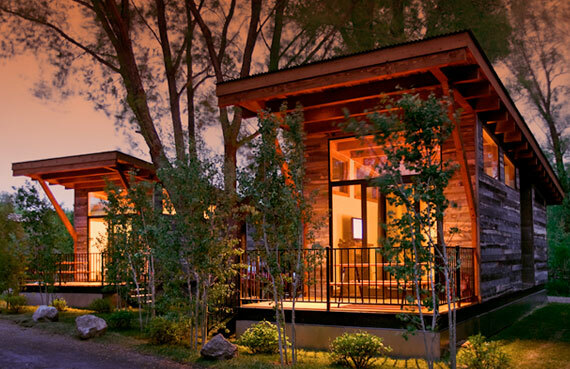 Efficiently designed and sustainably built, the tiny "rolling cabins" are technically recreational park trailers (RPTs), designed as temporary living quarters and rentals. The Wedge model (shown here) features a bedroom, bathroom, kitchen/living space and a private deck. Exterior finishes include rustic cedar siding with a barnwood patina colored stain.